The Union of the Affected by Texaco’s Oil Operations (UDAPT) have branded last week’s ruling by the Permanent Court of Arbitration in The Hague “inapplicable,” and vowed to take the Ecuadorean state to international human rights courts if it chooses to annul a ruling against Chevron-Texaco for pollution of the Ecuadorean Amazon. In a press conference Monday, representatives of the group said the local US$9.5 billion ruling, which was recently ratified by the country’s Constitutional Court, in favor of those affected by the pollution from the company’s extractive operations should be allowed to stand. “It is unconstitutional to demand the Ecuadorean state nullify a ruling ratified by three levels of the judiciary. ... The tribunal cannot force a state to violate its constitutional norms, disrespect the separation of powers and jeopardize the constitutional and legal guarantees protecting the human rights of Ecuadorean citizens,” Pablo Fajardo, UDAPT’s lawyer said Monday. 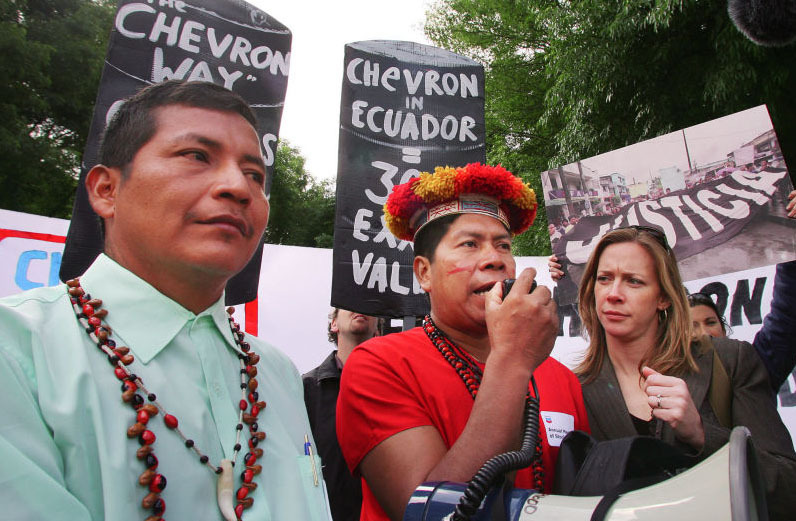 On Friday, Ecuador’s Solicitor General informed the country that the international court in The Hague ruled in favor of oil giant Chevron and declared Ecuador guilty of violating a bilateral investment treaty signed with the United States in 1997, of withholding justice from the company, and for not providing Chevron with “just and equitable” treatment. The solicitor general explained the rulings two immediate consequences: Ecuador will have to pay economic reparations to Chevron, and it will have to annul the sentence in favor of the 30,000 people affected, which was ratified in July by the country’s highest court, and which was dismissed in August. However, representatives for the affected communities said Monday, that should the state choose to move forward with annulling the ruling, then they will challenge the decision internationally if they have to. We "will immediately refer to the Inter-American System for the protection of human rights, the Andean Court, the United Nations, and other international panels to condemn the government of Ecuador if it decides to put the obligations arising from the ruling before its international obligations in the field of human rights,” UDAPT said in a statement. “The Chevron III case was always a mechanism of blackmail used by the oil company on Ecuadorean governments to seek to interfere in private litigation, in which the state should not influence in any way," Fajardo explained. Affected communities argue that Chevron’s lawsuit against Ecuador should not affect the legal process the communities had successfully brought against Chevron. If the Constitutional Court ruling is annulled, the cases presented by UDAPT in countries where Chevron has assets will lose their legal base, reducing their ability to secure compensation.